Many gardeners seek an heirloom seed catalog for their spring flower and vegetable garden purchases. Heirloom seeds offer many benefits beyond vintage varieties. There's no one exact or proper definition for heirloom seeds. Most people agree that heirloom seeds are vintage seeds, that is, varieties that were grown in the past. Some, like the Mortgage Lifter tomato, can trace their lineage to a very specific time and place. In the case of the Mortgage Lifter tomato, the seeds can be traced back to a man in the 1930's who bred tomato plants until he came up with one that bore gigantic fruit; he sold the plants and used the proceeds to pay off the mortgage on his farm, hence the name "Mortgage Lifter" given to this heirloom variety. However, modern concerns have been added to seeds, and many so-called heirloom seeds include additional qualifications. Many heirloom seeds are now also marked as non GMO, or non genetically modified. Genetically modified seeds may have genetic material inserted into their genome to make them more disease resistant, suitable for long term storage, or give them another characteristic. There is some concern that GMO seeds and food grown from genetically modified seeds may be harmful to humans, so gardeners, particularly organic gardeners, seek sources of non GMO seeds. Many heirloom seeds are open-pollinated as opposed to hybridized. What's the difference? Open pollinated seeds depend upon insects such as bees or the wind to move pollen from flower to flower to create seeds. Seeds from open pollinated plants always breed true and produce seeds that will germinate. If you grow open pollinated corn, dry the ears, harvest the corn seeds, and then plant them next year, they will grow the same type of corn. With hybrid seeds, the babies from seeds produced by the parent plant will not look like the parents. They may be a different color of flower or a very different tasting vegetable. Sometimes the seeds are sterile and will not grow. Most gardeners agree that heirloom seeds are older varieties, with the generally accepted range of 50 years or older. There's really no hard and fast rule as to what constitutes an heirloom seed. Heirloom seeds offer many benefits. First, because many hail from a time long before commercial pesticides were available, they are often more disease resistant than hybridized varieties. Natural selection ensured that any plants surviving to future generations were the fittest plants possible, capable of resisting fungal diseases, insect attacks and the like. Many heirloom varieties are quite beautiful. They offer a glimpse into gardener's past. For anyone looking to create a specific period garden, say a Victorian cottage garden, growing the same species, colors and varieties as the Victorian gardeners of old can lend a special air of authenticity to the garden. You may be able to find some heirloom seeds at your local garden center or large home, garden and lumber super center. 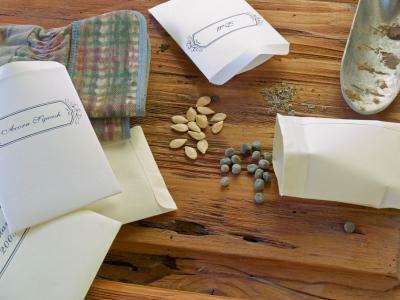 Many carry at least one company's heirloom seeds or will sell packets marked "heirloom variety". Heirloom Seeds features flower and vegetable seeds at no frills prices. Many are listed with the plant's unique history, which can be fun to learn before purchasing seeds. Baker Creek Seeds offers heirloom varieties and many hard to find varieties. Victory Seeds offers rare, hard to find, heirloom open pollinated seeds through their website and catalog. Hometown Seeds offers long term food storage and survival seeds. These heirloom and open pollinated varieties are sealed for long-term storage and an excellent value. This company specializes in vegetable seeds. Seed Savers Exchange is a non profit organization dedicated to the preservation of heirloom varieties. The company offers a catalog and online shopping. Whether you're looking to add vintage charm to the flower border or new and fun disease-resistant vegetable varieties, heirloom seeds are fun to grow and enjoy.